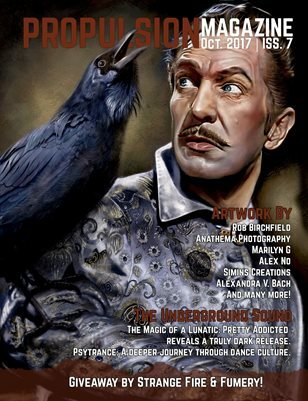 Propulsion Magazine celebrates it's rebirth with our first issue back, just in time for Halloween! Featuring artists Rob Birchfield, Anathema Photography, Marilyn Garrett, Alex no, Simins Creations, Alexandra V Bach, Pretty Addicted, and more! Plus a limited edition prize package from Strange Fire and Fumery! Get yours today, and view our website to submit!